Guidry's Cajun Gumbo 6.5 oz. 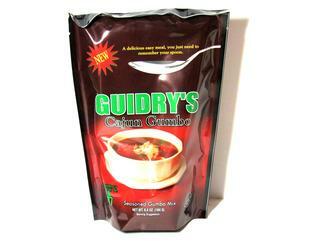 Home » Products » Cajun Dinner Mixes » Roux & Gumbo Mixes » Guidry's Cajun Gumbo 6.5 oz. Craving Cajun Seasoned Gumbo Mix is an authentic Cajun gumbo that cooks in just three easy steps. Add your choice of meat: chicken and/or sausage, cook, and serve over rice and with a side of potato salad. This Cajun Gumbo is made with a fat-free roux.